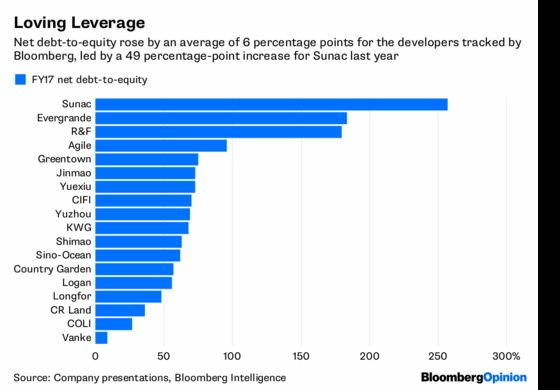 (Bloomberg Opinion) -- Hong Kong developers have a shiny new target in their sights: China’s office market. And while the prices they’re paying may be breaking records, the prospects for commercial property on the mainland have rarely looked better. Hang Lung Properties Ltd. last week paid 10.7 billion yuan ($1.7 billion) for a prime plot in southern Hangzhou, home of Alibaba Group Holding Ltd., beating out more than 300 other bidders, including the tech giant itself. Hang Lung’s bid was more than twice the asking price and the sale marked the company’s first acquisition of land in China since 2013. Shui On Land Ltd., meanwhile, is in the final stages of bidding for a plot near Shanghai's Xintiandi entertainment district. Hong Kong’s real estate firms are diving back into China after years of getting squeezed out by cashed-up domestic players such as China Evergrande Group and China Vanke Co. However, President Xi Jinping’s deleveraging campaign has made funding harder to come by, giving Hong Kong developers, with their easy access to cheap credit, an advantage. Also, as office prices in Hong Kong reach stratospheric levels, China looks a lot more affordable. Prime office yields in the former British colony are about 2.8 percent, compared with 4 percent in Beijing and Shanghai, according to CBRE Research. China is keen for its cities to look the part as the new economy takes off. Foreign developers are often seen as being of a higher quality and that helps when securing land in tier one cities, according to Joe Zhou, head of research at property group JLL. Hong Kong developers, with their ties to luxury brands and experience in running glitzy malls, have an edge. Bloomberg Intelligence’s Patrick Wong says high-end retailers are more willing to open stores in a shopping center run by a Hong Kong firm than a mainland one. This isn’t an all-out investing trend as it was a decade ago, though, when China’s economy was expanding at a much faster pace. Now, developers are being more selective, picking the cities they think will benefit most. So that means, Shanghai, for example, as it places more importance on fintech, and Hangzhou, where the tech action is. 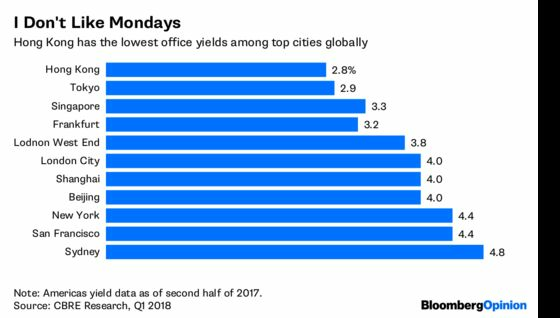 Yields also aren’t what they used to be, with average prime office returns in China’s big cities down to as low as 3.5 percent from around 6 percent five years ago. But according to Zhou, most investors are confident that the growth of new-economy businesses will lead to higher rents down the road. So long as Hong Kong developers maintain some discipline, this should be a smooth ride to the top.